There has been a mutation in the world of crisp description, further to my earlier post on the over-adjectivisation of premium crisps. 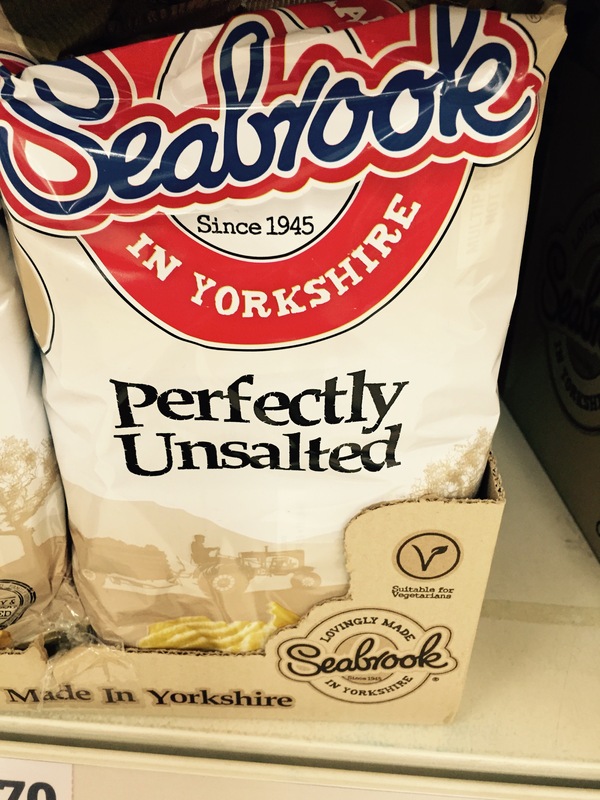 ‘Perfectly Unsalted’ now seeks to make a virtue of not adding something to something else. They have not salted these crisps so perfectly that you might not notice that they are simultaneously perfectly unencumbered with prawn cocktail flavour and offer not a whiff of that beef flavour that doesn’t actually taste of beef. Not salting something is definitely not a ‘thing’ and so Seabrook’s – formerly notable only for their excessive use of unnecessary “quote” “marks” on their packaging – win a new accolade for being the first to name a crisp flavour after something that the crisps don’t, taste like and don’t contain. Let’s have a fuddle, says, seemingly, everyone everywhere. Being from the wrong side of the Pennines, it took a while to establish what this curious tradition might be. And it turns out that it’s a sort of ad-hoc buffet held in an office, where all the food is provided by the people who work there. It sits there all day, on a low cupboard, getting warmer and progressively less hygienic, and promotes a culture of greed to go along with that of botulism. A fuddle is mainly made up of Pringles, tortilla chips and pastry objects, sometimes with non-ambient dips and other assorted items typically found in a service station shop. Providing sustenance for an entire office, the fuddle transforms lunchtime from being a hurried sandwich snatched between meetings into an office full of people chomping on orange carbohydrates all day long simply because they are there. The fuddle works worst in call centres where there is a shift system in place. The lucky early shift gets to feast on sweet and sour prawns and pâté de not-quite-foie-gras, at 7 o’clock in the morning; the late shift make do with the crumbs from the bottom of a bag of value tortillas and the crisp-flecked smearings of a cheese and chive dip from the side of a well-scraped pot. Fitting firmly into the category of ‘enforced festive fun’, the fuddle happens mainly at Christmas. If you’re really unlucky, someone will bring a Christmas hits compilation and play it on repeat. Anyway, that’s what a fuddle is, although nobody appears to have told Urban Dictionary, which has quite a different take on things. 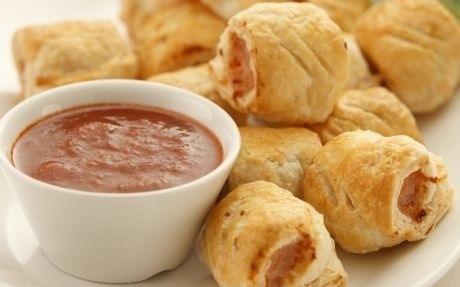 Does anyone fancy a Christmas fuddle? These are not just adjectives. These are excessive, ugly, ludicrous, multi-layered, obfuscatory adjectives sourced from our secret, exclusive, pointlessness reserves. And obviously that’s not a thing. Food manufacturers appear to be at war over who can cram the largest number of implausible benefits and features into the descriptions of their products. And it’s crisp manufacturers who are winning. No longer content to supply ready salted crisps (what was the ‘ready’ about anyway? ), manufacturers now offer us a baffling array of upgrades. Things started well: who, apart from people who really don’t care, wouldn’t prefer their crisps to be flavoured with sea salt or delightful flakes of Maldon? Where there may now be pepper, it must be black peppercorns, usually cracked, sometimes Indian, and probably from a particular province. I’m happy to believe that probably all pepper is Indian by default. Then we must upgrade the classic flavours. Vinegar? No chance. Balsamic vinegar. Cabernet Sauvignon vinegar. Cider vinegar. So now we have the cider vinegar and Maldon salt crisp. Add the word ‘kettle’ to reference the cooking method and perhaps the name of the orchard in which the apples grew, and the brewery in which they were converted into cider before being turned into vinegar and we quickly end up with a label which prattles on endlessly about provenance without getting away from the fact this is still a straightforwardly flavoured fried potato. Sometimes they’ll name the person who fried them; just as often, they’ll photograph the people who grew the potatoes. Into this escalation of hostilities steps Walkers, whose existing ready salted were found to be under-described and have consequently been relabelled as classically ready salted, and suffixed with the further detail that the salt is from Cheshire. Cheshire? Is that an important point on the salt tourism map? Has Cheshire suddenly been awarded protected designation of origin status on account of the quality and unique properties of its iconic salt? Walkers have rebranded an entire range of crisps without a single change in formulation. “Unmistakably Cheese and Onion with Cheddar from Somerset”. Well yes, Cheddar is in Somerset so you’d hope the cheese would be. Although “Cheddar from Cheddar” might be more reassuring. (More so than, for example, Sainsbury’s Taw Valley cheddar which sounds like it might be delightfully Somersetty. I’d never even heard of the Taw Valley, but it turns out that it’s 90 miles away from Cheddar in a completely different county). 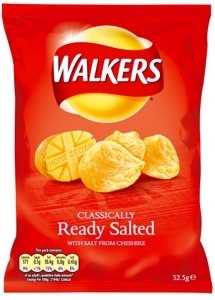 Walkers have rather given up with “Distinctively salt and vinegar with real British vinegar” though. Distinctive in that you can tell what the flavour is supposed to be? I do hope the salt is from Cheshire. I’d hate to think of those sodium chloride crystals being shipped in from foreign shores. Filthy, foreign salt. Elsewhere, “definitively” prawn cocktail crisps are made with the tomatoes provided by someone in the “Vale of Evesham”. I’m not sure what advantage the vale is meant to confer upon an essentially minging glop of ketchup and mayonnaise. I’d rather they’d focused on the prawn content, currently at 0%. At least it’s definitive though: don’t bother with any actual fish. Oh, and Walkers’ source their roast chicken powder from Devon, apparently. Powdered chicken is quite a delicacy down there. I obviously lay the blame for all this with Marks and Spencer, for those Dervla Kirwin adverts declaring that ‘this isn’t just a commercially mass produced chocolate pudding, it’s a thrice-baked 70% cocoa organic commercially mass-produced chocolate pudding with Madagascan vanilla made in the same factory and from the same basic ingredients as everybody else’s’. Yes. It’s all Dervla’s fault. But the next phase is to replace the adjectives with other food brands favoured by people who don’t really like food. Marmite and Reggae Reggae sauce are already established as the go-to flavourings for awful product cross-overs. I predict it will not be long before we see our first Cheese String & Strongbow Vinegar crisp. “With reggae reggae sauce from off of the telly”.